It has been one year since R W Armstrong announced the formation of its specialist historical repair and conservation division, Daedalus Conservation. The year has proved a very busy one with the services of Daedalus Conservation being in demand in National Trust properties, churches, museums and other historic buildings across the UK. 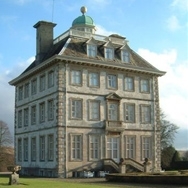 Notable projects in 2012 included working with the National Trust on an extensive external fabric repair programme to Ashdown House (pictured below). The works included stone tile roofing and leadwork, repairs to the cupola, and the repair and replacement of the chalk stone facades. In addition, the iconic Guildhall building in the centre of Guildford had significant works to stabilise the bell tower, and repair and re-roof the main hall and council chamber. All of which had to be undertaken within a short time-frame ready for the Olympic Torch procession. Specialist external and internal fabric repairs have also been undertaken to several historic churches, as well as completing a tile exemplar using hand made tiles for people to sponsor and raise money for their church. Daedalus Conservation specialises exclusively in the repair and conservation of historic buildings, providing expert consultancy, as well as offering all of the associated principle services; stonemasonry, carpentry and fine joinery, plasterwork and brickwork. For more details on our projects visit our ‘projects’ page.